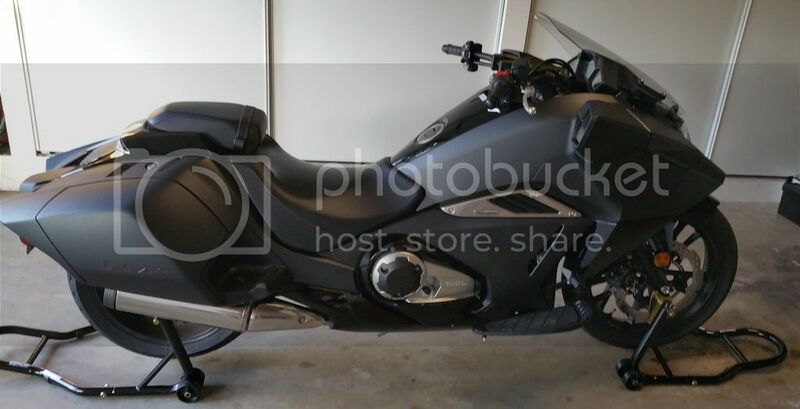 Honda Vultus Forum > Honda Vultus General Discussion > Honda Vultus General Discussion Forum > Do you jack up the NM4 like a cruiser or a sport bike? version, I'm not quite sure, especially on the rear if there is a place to hook it on for proper lift. Has anyone tried either of these with success? I also could not find an acceptable solution. I ended up getting the center stand for the NC700S, cutting the foot lever off and making it longer. 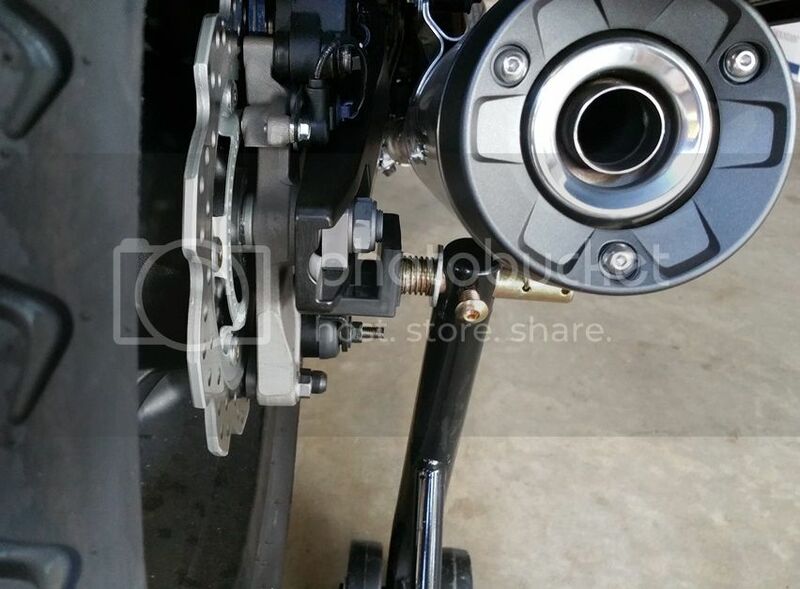 With the center stand deployed, the rear tire is off the ground enough to work on. If I remove the rear wheel, I can easily lift the front enough to get that off as well. The modification isn't hard, and I used JB Weld Epoxy, so you only need to be able to cut the foot tube (jigsaw with a metal blade is fine) and grind down a 3/4" diameter threaded rod piece that is 5" long. I used a simple angle grinder. So far, the JB Weld has been holding up to virtually daily use as I prefer to park the bike on the center stand than the side stand. There is a thread on the forum here that details the job. ANSWER: The NM4 is lifted like a Sport Bike. 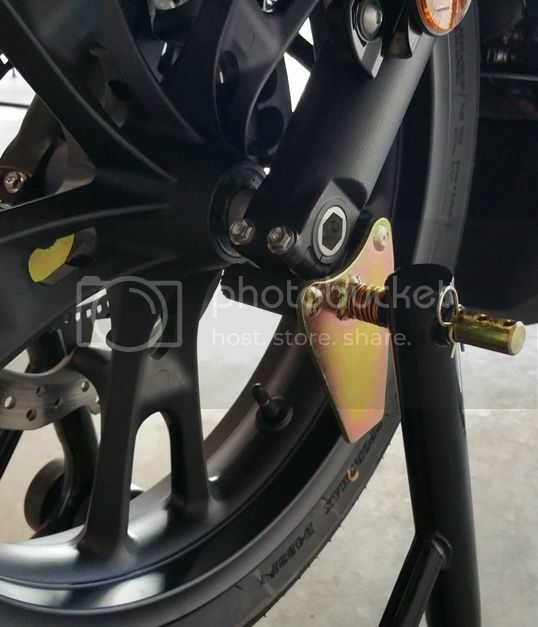 The rear wheel uses the universal paddle type on the swingarm. There's no place to place any spools. The front can be lifted by its forks. Here's a secondary question: If I wanted to use a triple tree stand to lift the front (maybe to change out a tire), what size pin does our NM4 take? The largest one I have is an 18mm and it's too small. Does anyone know this spec? Believe it or not, I called Honda Powersports, and they didn't know (how scary is that?). Any and all insight into this is greatly appreciated. So would that venom link you have to jack up sport bikes work for both wheels? 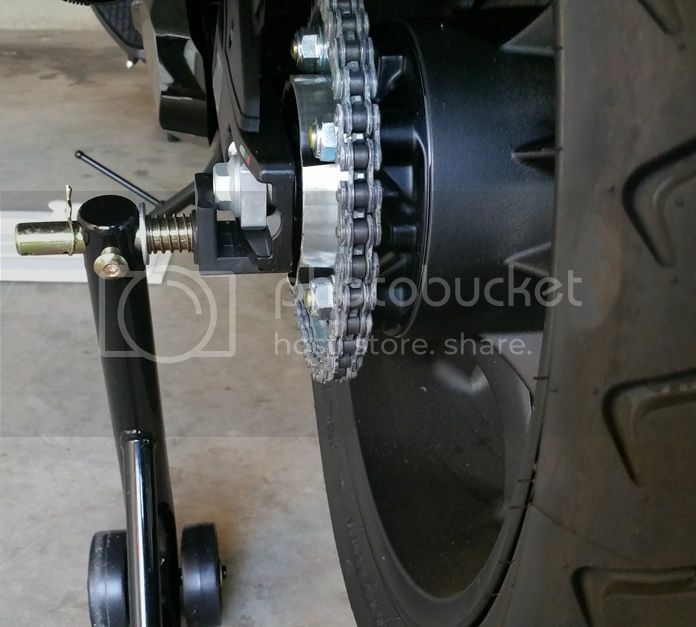 debating on whether to go paddock or center stand mod--dont have an angle grinder so would have to figure that into the cost. ChaosPuzzle Change and Hondissimo like this. Nice setup. What are the specific product models and numbers if I'd like to do the same ? Venom Motorcycle Front & Rear Paddle Combo Wheel Lift Stands Paddock Stands purchased as a set from from KapscoMoto. wow that looks great! Thanks for the pics, quite helpful. I am considering buying an NM4. How difficult is it to remove the paneling so that I can use a lift jack directly on the frame? I would suggest that you try to lift it up at the points where the mainstand can be put on so you do not even need to get rid of the tupperware. I took it from Chris an bought the mainstand of the NC 700 S wich fits to the eyelets behind the engine. Perhaps you can put a bolt thru those eyelets if they do not provide sufficient support for your lift jack. Good luck.